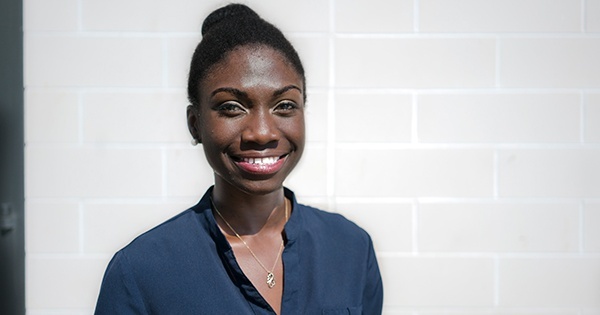 University of Delaware alumna Amira Idris recently represented the United States at the eighth annual Global Entrepreneurship Summit (GES) in Hyderabad, India. The GES is a two-and-a-half-day summit where emerging entrepreneurs, investors and supporters from every region of the world gather to network, receive mentoring and attend workshops. The annual event empowers entrepreneurs to pitch their ideas, build partnerships, secure funding, innovate and find their target customers all while creating new goods and services that will transform societies. Idris, who graduated from UD with a bachelor’s degree in bioengineering and biomedical engineering in 2015, and received her master’s degree in entrepreneurship and design in 2016, was sponsored by the U.S. Department of State while representing the U.S. at the GES. During her studies at UD Idris founded her own startup, TheraV, which develops technology that optimize pain treatment outcomes and improve quality of life without the need of narcotics or invasive surgery. Although the summit was for both men and women, the theme of this year’s event was “Women First, Prosperity for All,” which focused on supporting women entrepreneurs and fostering economic growth globally. “I enjoyed just meeting people from other parts of the world, seeing their projects, seeing what types of challenges they’re facing and seeing how entrepreneurs from every part of the world are going through similar challenges I’m going through,” said Idris.